Ecofinca Lo Favaret is located on a terraced hill with fantastic dry stone walls, in the foothills of the Natural Park of the Serra Boix – Cardo, in Baix Ebre, to the south of the province of Tarragona and less than two hours drive from Barcelona to the north and Valencia to the south. 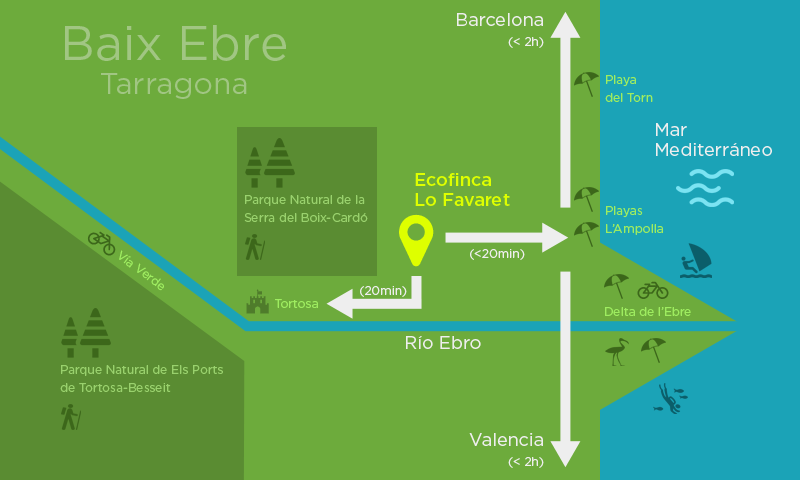 We enjoy a privileged view of the Natural Park of the Ebro Delta, which is accessible in 15 minutes. You will be surrounded by rice fields, many species of bird-life and nudist beaches, but avoiding the Delta`s mosquitoes. Halfway between the historic city of Tortosa and the seafaring traditional fishing village of L’Ampolla, we have direct access to both scenarios, the mountains and the sea, not forgetting the fluvial ecosystem of the river Ebro and its marvellous delta. From the highway to the Ecofinca Lo Favaret there are 10km accessed by paved rural roads. The last 400 metres is a dirt forest track suitable only for normal vehicles which are not too low or too long.